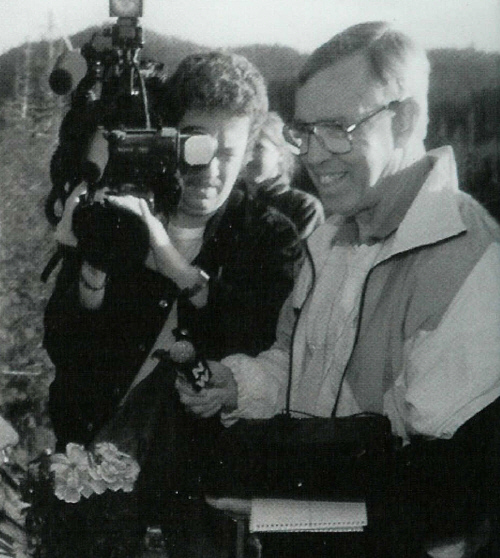 (1) Journalist George Garrett was presented with a Lifetime Achievement Award by the Radio/TV News Directors Association at a ceremony in Prince George on May 29/04. Garrett spent 43 three years at CKNW, retiring in 1999. His contacts in this province are legendary. It was Rafe Mair who first called Garrett the ‘Intrepid Reporter’. But it was his work covering the B.C. Pen riots and as an undercover tow truck operator to expose a scam in 1978 that gained the Saskatchewan native national acclaim. A couple of days before Garrett retired, former NW news director Warren Barker said thousands of people had been entertained, informed, helped and sometimes educated by his news coverage. "I cannot begin to count the number of times George's splendid performance made me, as his boss, look good," he said. Current news director Gord McDonald said: "Maybe what is most important about George is his compassion. His stories at times may have caused controversy and helped ruin careers, but George didn't hurt people, whether it was contacts or reporters who were competitors, he was never mean. "While George's ability to break stories was unparalleled, even greater was his integrity. Contacts trusted George completely. In a competitive business that can often get nasty, George earned the respect and friendship of other reporters. "Within this business, George was a competitor without enemies, and that is a rare thing indeed." (2) It was a veritable who's who of the old boys’ network as reporter George Garrett was roasted and toasted upon his retirement after 43 years at CKNW. And what a list of guests! Among them: Supreme Court Justice Wally Oppal, former PM Kim Campbell, Liberal leader Gordon Campbell, former Vancouver police chief Bob Stewart and a host of 'NW types, including Bill Good, Philip Till and the irascible Rafe Mair. But the man of the hour was Garrett, who throughout his career was generally regarded as a good friend of the police, as evidenced by the sheer numbers of Vancouver's finest in attendance. But our city's top cop was noticeably absent -- Police Chief Bruce Chambers, who also happened to be the target of the night's main running gag. (3) Journalism in Vancouver has dropped a considerable notch with the retirement of long-time CKNW radio reporter George Garrett. Elizabeth Aird did an excellent job of capturing the essence of George's dedication and humanity in the Jan. 25 profile, "CKNW's top dog calls it a career". I first met George when I was a student reporter for The Sun in the late 1970s. I remember his willingness to explain the craft to fellow journalists, with advice to rookies and tips to veterans. Subsequently, while working for the B.C. Federation of Labour and Premier Glen Clark, I was on the receiving end of the microphone many times, but George was always as gentlemanly as ever, even if the news story was an unwelcome one. Stories come and go, but George's class and kindness as a reporter will not be forgotten. (4) It is rare in the media business, like any other, to praise a competitor. But George Garrett is a rare competitor. In fact Mr. Garrett belongs to all of us in a way few attain. He has had the grace to help more than one new or late-arriving reporter to catch up on a story -- right after filing his own. His is a class act. His kindness and, yes, old-fashioned gentlemanliness is as legendary as his industry and his insatiable curiosity. He maintained both the trust of his contacts and professional objectivity -- the recipe for routinely scooping all comers. When he retires at the end of this month, CKNW will have lost a great voice, and the rest of the media will praise him unstintingly. And they will breathe a secret sigh of relief. (5) He's lucky he married the right woman. When George Garrett was a little younger, Joan Garrett usually answered the phone at 2 and 3 in the morning. It was his boss, Warren Barker -- this, after her husband had already worked a day shift. "He'd be so polite," said Garrett. “‘Oh, hello, Joan, does George happen to be around?' Then I'd get to the phone and he'd say, 'George, my boy, there seems to be a fire that sounds pretty good. They found a body. Would you mind wandering by there?' "
Would Garrett mind? "No, I couldn't get out fast enough." Twice, Joan saved him from driving through the garage door. "That bloody door." Nothing, not garage doors, not getting pounded in the L.A. riot, not a broken leg, not even the death of his son, has ever stopped George Garrett from getting a good story to air --first. CKNW's top dog has been driving his competitors’ nuts by scooping everybody in town, day after day for 43 years. But this is the end. George Garrett, 64, will sign off for the last time on Friday, Jan. 29. He started on Feb. 1, 1956. Nice symmetry for a man who likes order in all things. The man they call Gentleman George is as dapper as Fred Astaire, with buffed black-tasselled slip-ons and a small black comb to smooth his perfectly side-parted grey hair. He wipes his famously bucked front teeth with a pressed and folded white handkerchief. Something to do with scum, he says, and "because my wife tells me to." All this grooming, for a man his public never sees. Garrett's perfectionism has made him far and away the most respected working journalist in B.C. Garrett gets it right, and over the years even the twitchiest sources have learned that he'll nail the details and deliver the story straight and fair. As a result, nobody has sources like Garrett. At the moment he has 1,118 names in his Casio electronic organizer. Reporters joke that when he dies, they want to be named in the will for the Casio. His integrity and humanity are, if anything, more legendary than his accuracy. He has always helped other reporters. He has held stories rather than burn a source, harm a police investigation or hurt someone unnecessarily. He was the first to know of former Vancouver police chief Ray Canuel's death, and held it for a few hours at the family's request. He had a hot tip about the Gillian Guess story, but didn't use it because she would have found out she was being wiretapped. He got the scoop on the horrific 1982 Clearwater murders of the Bentley and Johnson families, ran it, and was devastated to find out afterwards that police hadn't notified the next-of-kin before his story ran. Sometimes he didn't have the nerve to ask the tough questions. In 1978 he didn't have the guts to knock on B.C. Court of Appeal Chief Justice John Farris's front door and ask him if he was cavorting with the prostitute Wendy King. He got beaten on the story. He's still visibly pained about some stories he was forced to air. In 1978, Garrett was on a police ride-along, tape recorder running, when the officers pulled over a stumbling-drunk B.C. Supreme Court Justice E. Davie Fulton at 70th and Granville. Fulton said to the police: "Do you know who I am?" When they asked him to get into the police car, he said: "Very well, I will not be a judge anymore," and told them to go to hell. Garrett considered holding the story, but found out that one had already run about an accident the same night caused by Fulton. The story ran, and Fulton's alcoholism went public. Garrett's invincibility on the crime-and-cops beat comes from being around first and longest. He was the only night man when he started as a reporter at 'NW. "That's how I got to know a lot of cops. I showed up at every two-car accident, and I did a lot of running. When I moved up to day shift I was still the only guy. I used to cover the court house, city hall, and cop shop, anything that happened like a fire or a murder, news conferences. I literally would run from the police station to my car, to city hall, up the steps and away you go. I loved it." He still runs all day. His alarm is set for 5:55 a.m. so he can hear the six a.m. news. He eats in his car, grabbing a sandwich from a cooler. He has to eat regularly because of adult-onset diabetes, and he's not one to sit around at lunch anyway. He's had lunch with police media liaison Constable Anne Drennan exactly once in the last two years. He doesn't regret not being around more for his kids. "Joan has often said she'd never say 'It's me or your job' because she knows she'd lose." She knew what she was getting when she married him 43 years ago. He's got no bad habits -- no boozing, no smoking, no womanizing -- just an addiction to news. In days past, he'd hang out at the police station nights, weekends, after hours. One disgruntled member of the force gave him a key to the fourth floor, which let him wander into the major- crimes unit. The cops let him listen to wiretaps before they were authorized. "They used to climb telephone poles and they'd say 'Hey, George, come and listen to this tape.'" He drank with them back in the '50s, too, when the detectives got together and had a party at the end of a murder case, especially if there was a conviction. "Some of them were in the back of the old city morgue and I'd walk by old Doc Harmon doing his autopsy and join the guys having a drink." Garrett and those cops grew up together, which is part of the reason he's ending his career on a journalistic high. He's doing a series now on the disastrous morale in the police department, his daily stories sourced by officers he's known for years. They're talking to him in their cars, or insisting on using land phone lines rather then cell phones. "They know if they get caught talking to me they're toast." Garrett cares deeply about the health of the police department, and he makes no bones about what he thinks needs to be done. On Philip Till's show Thursday night, Till called him "the man who wants to bring down the police department before he retires." Garrett replied: "No, just the chief." That's Chief Bruce Chambers, the only police chief in four decades who won't talk to George Garrett. Garrett is almost stumped when he's asked who he's disliked over the years, but it's Chambers he finally names. "That's not personal, it's what I feel he's done to the department . . . They're behind the eight ball, they're 90 members short on training, and it'll take a year or more to get them up to speed. They didn't anticipate the retirements. A lot of people have taken early retirement because they can't stand this guy. "I talked to an inspector I know very well and I said 'Am I on the right track?' He said, 'George, it's a mess, this guy is not a leader,' meaning the chief. People may think its some kind of vendetta, but in my mind it's not. It's a responsibility to the working members of the force, to make sure their frustrations are known." Garrett's ethics compel him to go after Chambers, and they're the only thing that ever stopped him from getting a story to air. Injury and loss never have. He kept working in 1987 when his only son and youngest child, Ken, drowned in a canoeing accident near Fort St. John. He was terribly proud of Ken, who at 25 was already the general manager of stations in Fort St. John and Fort Nelson. He is still proud of him for saving his fiance's life by pushing her on to the canoe. He visits his son's grave, and says he is with him every day. The most famous obstacle Garrett ever faced was when he covered the Los Angeles riots after the Rodney King verdict in 1992. He was standing at a street phone, calling in a live story to Bill Good's show, when four young black men surrounded him. He asked why they'd bother with an old guy like him. They said they didn't care. He was white. They took him into a doorway and smashed his face until he was rescued by some black passersby, who drove him to hospital in his rental car. Garrett still didn't stop. He drove himself back from hospital, through the ghetto, to his hotel, and proceeded to file a story on carjackings, all the while spitting blood on to his notebook. He came back to Canada minus a front tooth, and only then found out that his upper jaw was broken. He kept the bloody notebook as a souvenir. It's a long way from North Battleford, Sask., where the 17-year- old high-school dropout did his first interview for CJNB. Microphone shaking, he talked to the winner of the 4H Club's calf competition. He has never asked for a raise, although he gets a Buick Regal compliments of the station. He wanted to retire a year ago, but his bosses wouldn't let him. So he struck a deal: two months on, two off. Then he made a few mistakes on stories and couldn't shake the feeling that he was slipping. Now he's going on to another career. As George Garrett Consulting, he'll tell police how to deal with the media. People keep telling him to write his memoirs, but he never kept a diary and says he's not sure he can remember what he'd need. He'll golf a little, maybe join a gym. He doesn't really have hobbies. "My work is my hobby." His idols? "Hmm. Well, I deeply love my wife. I'd say she's an idol. My family, of course, and we're very fortunate to have two great sons-in-law. Politically, I thought a great deal of W.A.C. Bennett. He was a very nice man. I had respect for Bill Bennett because I thought he was a great manager." He chokes up when he talks about Warren Barker, 'NW news director for 32 years. It was Barker who took him back after Garrett detoured out of news between 1964 and 1976, and finally got fired as station manager in Trail. "I came back with my tail between my legs and went to see Warren, whom I idolized. He said, 'You have a job and I'll pay you the highest that I can for a newsman.' It meant so much. Then after I'd been back for a couple of years he made me a so- called investigative reporter, which meant that I could just go dig. He never let me down." Reporters he most admires? The three Jacks -- Webster, Wasserman and Brooks; Tom Ardies; and -- the only one still working -- Tom Barrett of The Sun. Garrett may be famous for modesty, but he wants a mighty fine goodbye. He wants a reporters' party at a restaurant somewhere, and he's thrilled that a massive roast is being organized to see him on his way. After his last day at work, he'll go out for dinner with Joan, his daughters Linda, and Lorrie, and their husbands. After Friday, there will be a huge hole in Vancouver news coverage. George Garrett is the last of the old-timers, a walking archive, one of the guys who have been around long enough to see past, present and future in a breaking story. His own estimation of his absence is typical, of course. "It would be immodest of me to say. I'm just one of many reporters in town." He leaves us, at least, with hints of a tantalizing Garrett tip, this one about the APEC debacle. "I don't think the RCMP did everything right nor do I think they did everything wrong. I think there's a valid reason for them acting very quickly to get people out of the way. I know what it is, but I can't tell you. It's part of the evidence, and I haven't used it because I think it would harm the commission." George Garrett - to the end. (6) Garrett has twice been severely injured on the job, once while reporting from a war zone, once in a ferry lineup. While covering the 1992 Los Angeles riots after the Rodney King trial, Garrett was phoning in a report (``live'') when he was attacked on the street by four thugs, one of whom crushed Garrett's jaw, nose and cheekbone with one punch and stole his tape recorder. This summer, returning from a legislative session, Garrett's car was broadsided by a cement truck on the Tsawwassen causeway. He took 30 stitches to the head, suffered bruised ribs and bleeding contusions in one lung. He believes the fact that he prefers heavy cars saved his life. Fractures, stitches and prolonged pain are a heavy price to pay for the most prestigious journalism award in the province, but Garrett figures he got a deal.